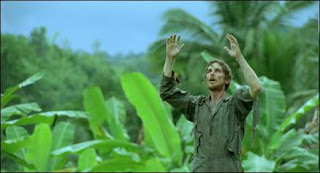 Based on Werner Herzog’s documentary Little Dieter Needs to Fly, Rescue Dawn goes deeper into the story of Lieutenant Dieter Dengler in this gripping account of the German-American’s heroic escape attempt from a POW camp in Laos after he’s shot down just forty minutes into his first bombing mission. Part of the initial top-secret operation by American military in 1965, Dengler is offered the chance for release if he signs a statement by his captors that decries his adopted American homeland but refusing to go against his own beliefs, Dengler ends up alongside other POWs including Americans Duane Martin (Independent Spirit Award nominee Steve Zahn) and Eugene McBroom (Jeremy Davies) with whom he tries to inspire with his ingenious plan to try and flee their Laotian captors once the monsoons begin and they’ll have access to water. Shot in forty-four grueling days in Thailand, Herzog’s sleeper masterpiece was quietly released at art-houses across the country earlier in 2007 and just as quietly onto DVD shelves later in the year where, despite numerous critical accolades and recent awards talk, it’s destined to be overlooked in the sea of major disc releases such as Transformers and Live Free or Die Hard but for those who take the time to seek it out, it’s a wonderfully powerful hidden gem. Featuring yet another excellent turn by Christian Bale which, when analyzed alongside his stellar portrayal in 3:10 to Yuma will make it a crime if he is forgotten during Oscar time, the real beauty of Rescue Dawn is in the naturalist turns by the main three leads who, most likely due to the fact that they all went on frightening diets dropping 33 (Davies), 40 (Zahn) and 55 (Bale) pounds respectively and the grueling shoot of physically demanding scenes, flourish in one another’s company and challenge each other admirably. Zahn is particularly a revelation considering his most usual goofy screen persona in films like Happy Texas or That Thing You Do and it’s fascinating to watch him, along with the other actors (especially Bale who actually did the things shown in the film) recollect on their experiences in a forty-four minute worthwhile behind the scenes documentary that for once, seems less about publicity and more about the human experience that’s available on the DVD. An unforgettable film in the distinguished career of Herzog and one that captures the very best performance of Zahn and one of Bale’s top five as well.